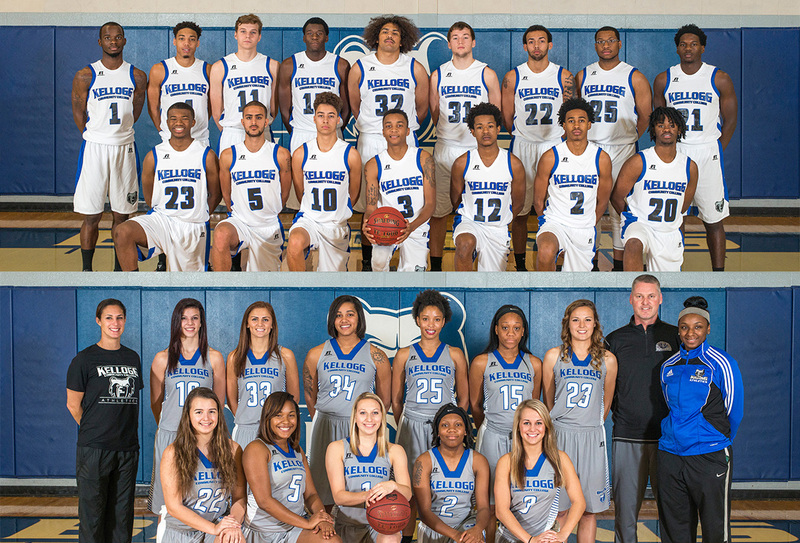 Kellogg Community College’s 2015-16 men’s and women’s basketball seasons are underway and include a dozen home games per team in Battle Creek. All KCC basketball home games, like home games for all KCC athletics teams, are free and open to the public; KCC basketball home games are held in the College’s Miller Gym on campus at 450 North Ave., Battle Creek. KCC’s men’s basketball team’s full roster and schedule are available online at www.kellogg.edu/mens-basketball. High-resolution team and individual photos of KCC’s men’s basketball team can be downloaded for use by fans and the media from the College’s Flickr page at www.flickr.com/photos/kelloggcommunitycollege/sets/72157660801328622. For more information about KCC’s men’s basketball team, contact Head Coach Ben Reed at mbbcoach@kellogg.edu. The women’s basketball team’s full roster and schedule are available online at www.kellogg.edu/womens-basketball. High-resolution team and individual photos of KCC’s women’s basketball team can be downloaded for use by fans and the media from the College’s Flickr page at www.flickr.com/photos/kelloggcommunitycollege/sets/72157660801687302. For more information about KCC’s women’s basketball team, contact Head Coach Kyle Klingaman at klingamank@kellogg.edu. To sign up for our email list to receive KCC men’s and women’s basketball results and statistics by email following each game, visit www.kellogg.edu/athletics and fill out the “Get KCC Athletics Results by Email” form.